Dan Saladino looks at our long and tangled relationship with spaghetti. With carbs and meat under scrutiny Dan asks what the future holds for a much loved British classic Spag Bol. Dan Saladino looks at our long and tangled relationship with spaghetti. Both carbs and meat are under scrutiny and Mintel, which monitors consumer behaviour around the world, says we're eating less pasta. With that in mind Dan explore the past, present and future of a much loved British classic, Spaghetti Bolognese. Food historian Polly Russell uses the British Library's archives to help plot Britain's love affair with pasta, and goes in search of some of the earliest references and recipes for 'spag bol'. 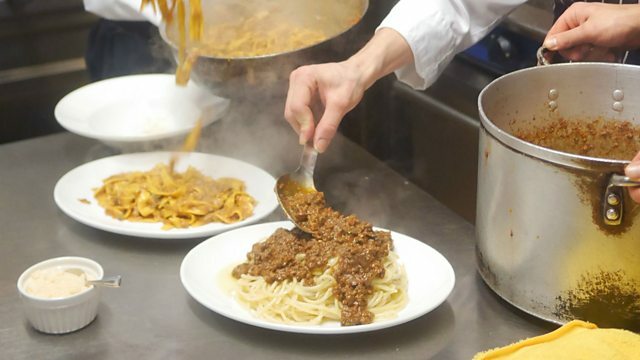 The food writer Daniel Young of Young and Foodish takes Dan on a tour of spaghetti history with lunch at The River Café, not the world famous restaurant but a traditional British café of the same name run by an Italian family who arrived in London in the 1950s. Spag Bol has been on their menu for nearly half a century. Meanwhile Dan's dad Liborio, who arrived in the UK in the mid 1960s finds out if his Britalian style spaghetti Bolognese sauce has enough to impress Giorgio Locatelli. The historian, John Dickie, author of Delizia, explains how making a television series for Italian television, Eating History (for SBS Food), led him to the world's first ever pasta factory. Dan also visits Italy's biggest pasta factory, owned by the Barilla family, where miles of the 'Spaghetti No.5' shape flows off the production line. Jacob Kennedy, chef and owner of Bocca di Lupo, together with Daniel Young, help Dan stage a pasta pop-up event at which the authentic Tagliatelle al Ragu Bolognese is pitched against a 1960s style Spag Bol. Have British eaters become too sophisticated for the home grown and will they vote for authentic Italian tradition instead? If this programme doesn't make you want to sit down to a big bowl of pasta and ragu, nothing will! It is worth having a butcher mince the meats coarsely (8mm), for the improved texture. Peel and dice the carrot, dice the celery, chop the onion and slice the garlic.Take a very wide frying pan (30cm), and melt the butter in the oil over a medium heat. Add the vegetables and pancetta along with a good pinch of salt and saute for 10-15mins until softened. Increase the heat to high and add the meat in four or five additions, allowing time for any water to evaporate, stirring and breaking up any lumps with a spoon. After the last addition, wait until the pan starts to splutter slightly, then decrease the heat to medium and fry, stirring occasionally, until the meat has browned with a fair proportion of crispy bits – about 15-20mins. Deglaze with the wine, then transfer to a saucepan along with the milk, tomartoes and stock as well as a good grinding of pepper and more salt to taste. Cook at a very gentle simmer, uncovered, for about 4 hours until the sauce is thick, more oil – than water-based (add a little stock or water if it dries too much or too quickly. When ready, the liquor will be as thick as double cream and, stirred up, the whole should be somewhat porridgy. Adjust the seasoning one last time. The addition of bay and/or dried chilli flakes along with the meat is heretical, but not displeasing. This recipe yields 1.75 litres, enough for 800-900g pasta; use 400ml for 200g dried or 260g fresh tagliatelle. Heat the ragù in a frying pan with a little pasta water. Drain the boiled pasta when marginally undercooked, then add to the sauce to finish cooking for about 20 seconds, with knobs of butter. Serve with grated Parmesan on top.